John Adams Whipple. Grafton, Massachusetts 1822 – 1891 Cambridge, Massachusetts. Henry Winthrop Sargent and His Family, c. 1850-1853. Half-plate daguerreotype in case, 4 ¾ x 6 x in.Gift of Aimée and Rosamond Lamb, 1982. The Boston Athenæum owns about three hundred daguerreotypes, many of which are portraits of Boston families. In recent years the Library has also focused on collecting examples of the work of Boston daguerreotypists that are “maker-marked,” that is, with the artist’s name stamped on the mat, embossed on the velvet pad facing the image, or inscribed on an advertising card placed in the case. Working from these identified examples, it is sometimes possible to attribute unsigned works to the same maker on the basis of poses, studio furniture, backdrops, or props. This attribution technique works particularly well in the case of John Adams Whipple, one of Boston’s pioneering daguerreotypists, who was a competitor of the great Southworth & Hawes studio. Whipple kept several distinctive pieces of furniture in his studio that he used to solidify his compositions by disposing them within an image in characteristic ways without having the sitter use them. 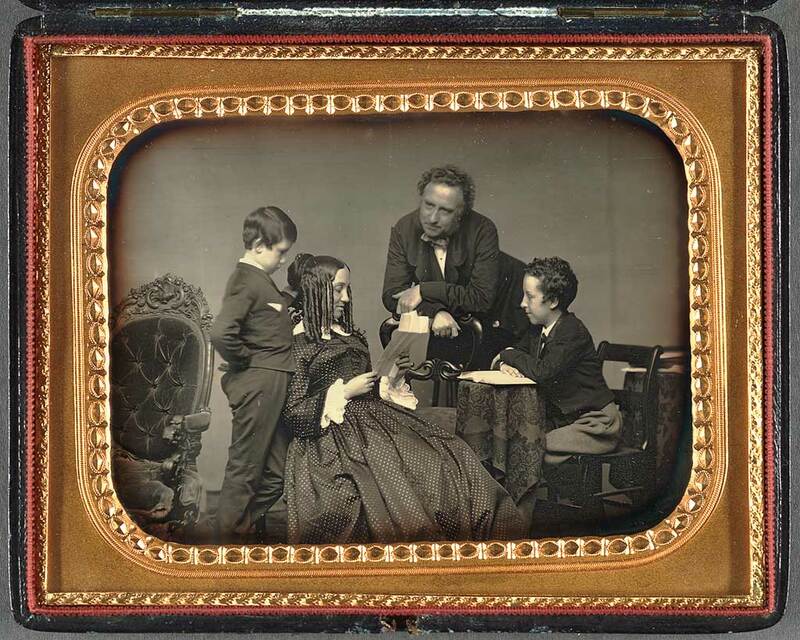 In fact, it is this unique posing style that identifies Whipple as the artist of the portrait of Henry Winthrop Sargent and his family, taken in Boston in the early 1850s. Here, Whipple’s composition is complex and masterful. The empty armchair at the lower left faces the viewer and draws the eye in. The covered table at the far right connects an occupied chair to the edge of the plate and suggests a vanishing point while giving diagonal movement to what is basically a horizontal composition. The corner of a plain backdrop, barely perceptible at the right, aids the illusion of movement and space. The empty armchair acts as a backrest for young Francis Sargent (1844-1869), who is actually supported by a posing stand, the base of which can be seen between his feet and his mother’s skirts. Caroline Olmsted Sargent (1819-1887) appears to be reading a letter to her assembled family. Her oldest son, Winthrop Henry Sargent (1840-1916), sits facing her, and their profiles echo across the space as he leans toward her. Henry Winthrop Sargent (1810-1882), at the apex of the composition, leans dynamically into the gathering, supporting his weight on the back of a carved side chair. The division of the family into two pairs of linked figures creates powerful parallel diagonals; but despite this calculated arrangement, all of the sitters appear to be at ease and engaged with one another. The Sargent family was wealthy and cultured. Henry Winthrop Sargent, the patriarch of the group, was descended from an old Gloucester, Massachusetts, family and was the son of the successful Boston artist Henry Sargent (1770-1845). Like his father, the younger man attended Harvard, graduating with the class of 1830. Although trained as a lawyer, he entered the financial world as a member of the firm of Gracie & Sargent in New York. In 1839 he married Caroline Olmsted of New York and soon retired from business to embrace the life of a country gentleman. It was the beginning of his true career. About 1840 Sargent purchased Wodenethe, a twenty-acre estate with a partially built house on a plateau above the Hudson River about sixty miles north of New York City. The property presented many challenges, and Sargent set about improving it by planting some trees to hide objectionable neighboring buildings and removing others to open vistas. On trips abroad, he visited the great gardens of Europe and was particularly inspired by Bellagio on Lake Como in Italy. He visited nurseries and imported expensive novelty plants, most of which failed to survive the climactic extremes of the Northeast. In this way, Wodenethe became an important horticultural test garden before the establishment of arboretums. After Henry Winthrop Sargent died in 1882, his son, Winthrop Sargent, continued to maintain and improve Wodenethe. Winthrop and his wife, Aimée Rotch (1852 - 1918), lived there in the summer and wintered in Boston. During this time, Wodenethe was the subject of articles in a number of leading journals. One of these carriedthe title “The Most Artistic Twenty-Acre Place in America” and observed that the landscaping at Wodenethe “always suggests the glories of nature rather than the triumphs of art.” Unfortunately, the estate did not survive; but the appearance of its house and grounds are preserved in a large collection of photographs taken by Aimée Rotch Sargent and others now in the collection of the Boston Athenæum. The daguerreotype of Henry Winthrop Sargent and his family came to the Athenæum as the gift of Aimée and Rosamond Lamb, nieces of Aimée Rotch Sargent. Over the years, the Lamb sisters gave the Athenæum many gifts representing the accomplishments of their distinguished family. These include an extensive collection of family letters and photographs, the sketchbooks of Benjamin Smith Rotch (1817-1882), in which he recorded his travels, watercolors by his son Arthur Rotch (1850-1894), which, among other things, document his student days at the École des Beaux-Arts, Paris, and paintings by Aimée Lamb (1893-1989) and by another aunt, Rose Lamb (1843-1927). Obviously, a very strong creative impulse—and a benevolent spirit—ran throughout the family. Sally Pierce, from, Stanley Ellis Cushing and David B. Dearinger, eds., Acquired Tastes: 200 Years of Collecting for the Boston Athenæum (2006): 311-313. Copyright © The Boston Athenæum. Andrew J. Downing, A Treatise on the Theory and Practice of Landscape Gardening, Adapted to North America, ed. Henry Winthrop Sargent(New York: A. O. Moore & Co., 1859), 430. Ibid., 547. After Downing was drowned in a steamboat accident on the Hudson in 1852, Sargent continued to champion his principles and in 1859 brought out the sixth edition of his Treatise. Wilhelm Miller, “The Most Artistic Twenty-Acre Place in America,” Country Life in America 22 (September 1, 1912): 19-22, 50-52. Also see “Wodenethe,” Garden and Forest 10 (November 17, 1897): 449-450; and Town & Country (March 12, 1910). Harry Katz, A Continental Eye, the Art and Architecture of Arthur Rotch (Boston: Boston Athenæum, 1985).